Most people would be thrilled to be on a break from their job, but not us. We found ourselves longing for “our” dog, Spare, while he was back where he belonged on his comfortable doggy bed in his usual home. On a typical day in Grenada, Spare would hangout with us while we blogged, lay on his back while we did shavasana and constantly be around us to receive pets, hugs and kisses on his head. After two weeks of getting to know Peter & Julia better, and totally confusing Spare, we were off. We gave Spare-do (yes, we’ve given him a few names) one final cuddle and said our goodbyes before boarding the lovely Osprey Lines Limited ferry that would start our two-week Caribbean holiday! We planned to be on Bequia Island in St. Vincent & The Grenadines for my 30th birthday on June 26th, so we left Grenada on the 22nd. Even though it was 8:00am, the sun was intense so we decided to enjoy the ride from inside the boat rather than on the top deck. I get pretty seasick, but as we got settled in and had a look out the window, the waters looked calm and welcoming. We cruised effortlessly over the turquoise sea, hugging the western Caribbean coastline of Grenada on our way north to the island of Carriacou. 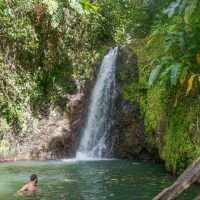 Seeing the sister island of Cariacou is one of the top things to do in Grenada. I’m a bit scared of the ocean so I was anxiously waiting for the passageway between the two islands, which is about a 50km open-sea crossing. This is where we were to expect rough waters of the Atlantic, but since it’s summertime, I was assured that the seas were to be calm. As the very northern tip of Grenada was behind us, the massive, rolling swells showed up in front – right about the time Nick decided to go on the top deck for a quick video. 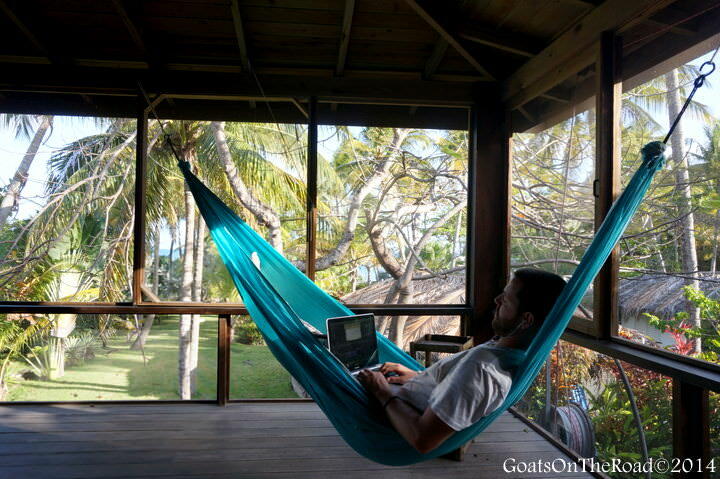 The life of a travel blogger can be an adventurous one! Too hot to ride on the top deck… This is when the seas were calm. After a little while I went outside to check on my beloved Goat. We yelled back and forth over the wind and carefully made our way back down and inside to the safety of the boat. The journey was meant to take us 1 ½ hours, maybe 1¾ if the seas were rough. 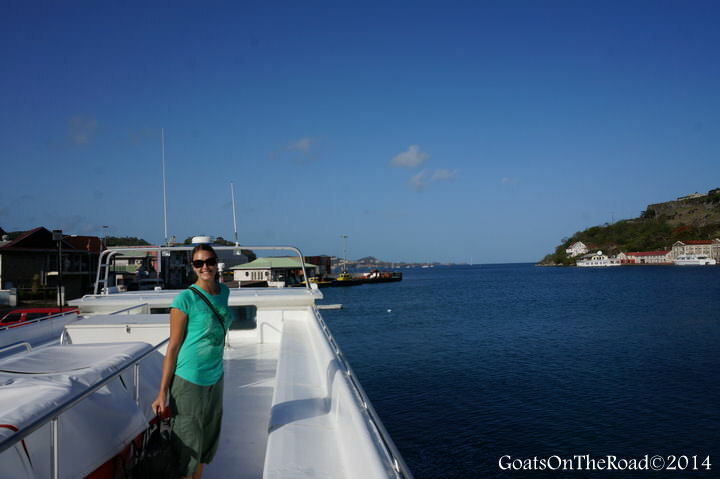 We arrived in Carriacou more than 2 hours later! As we neared the harbour on Carriacou the water calmed to glass and took on a clear turquoise hue. Sandy shores greeted us at the dock and as we stumbled down the streets to the Townhouse Guesthouse, we still felt like we were rocking on the ferry. After checking in and seeing the chilled out streets, we knew this little island in the Caribbean would be a great place to relax for a day, before venturing out into the seas once again. 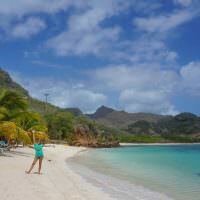 Stay tuned for more of our amazing vacation in the Caribbean paradise of St.Vincent & The Grenadines! 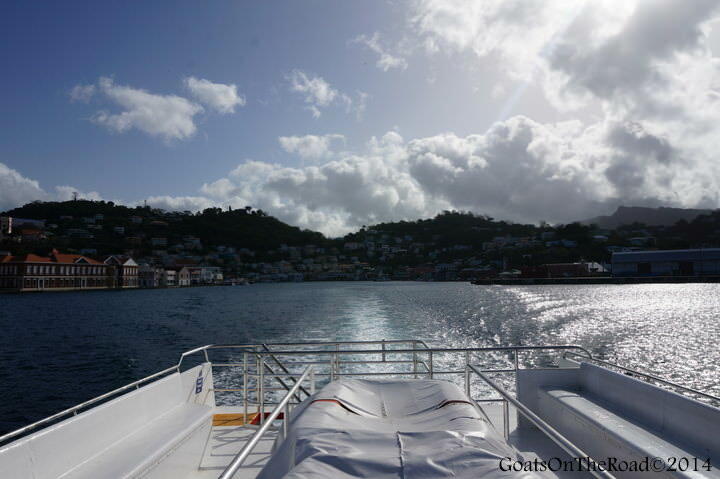 The Osprey Lines Limited ferry is an affordable inter-island option between the islands of Grenada, Carriacou and Petite Martinique. 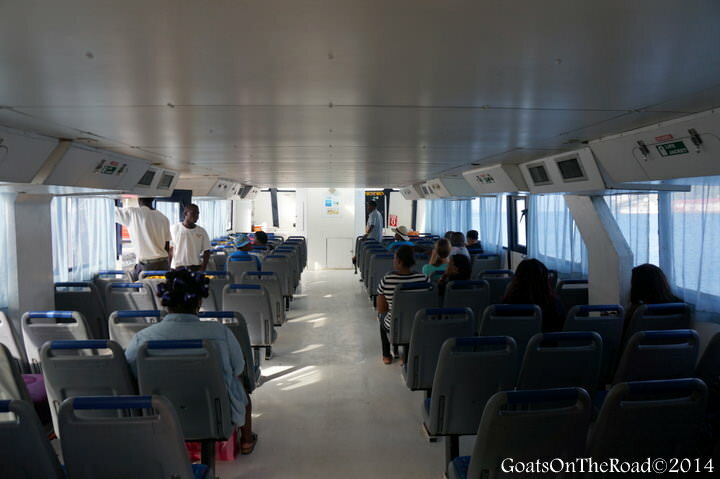 The cost of the journey between Grenada and Carriacou is $80EC each way. You can find out more about the Osprey Lines schedule and fares here. Typically the summer months have the calmest seas (our day was unusually rough). Check out the The Townhouse, which is a good budget/midrange accommodation option in Carriacou (double rooms with a/c, bathroom and t.v. cost $165EC). Kayak Cafe is a funky restaurant set right next to the dock along Main St. (just across from the Townhouse). Owned by a friendly South African woman, the fresh fruit juice ($6EC), bacon & egg sandwich ($12EC) and massive conch-fritter meal ($25EC) are famous! A huge thank-you to Osprey Lines for not only getting us to our destination in one piece, but for providing us with ferry tickets and a room at their affiliated hotel, The Townhouse. As always, all thoughts, opinions and views remain our own. Great post, you guys seem to have had lots of fun. Cheers for the comment! Happy trails. 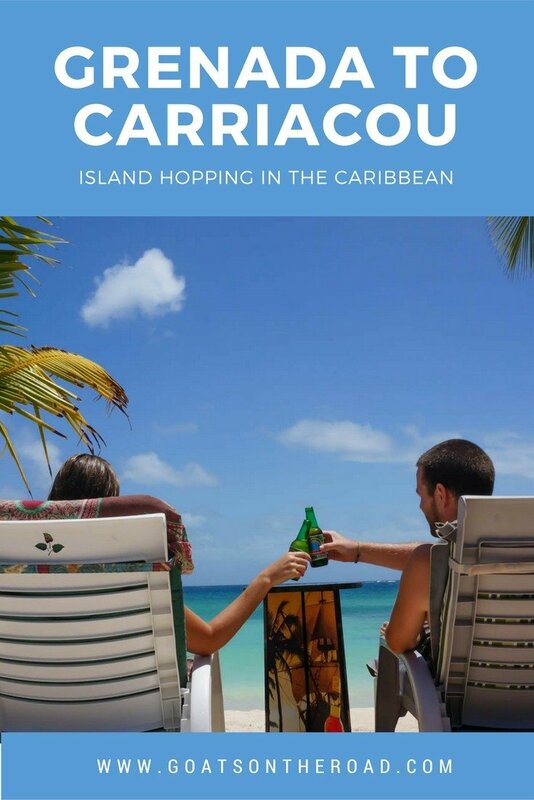 I wondered about ferries in the Caribbean as I had heard that it was hard, if not impossible, to island hop there. Great to know that there are options between some islands at least. I’ve done wavy voyages in Thailand before … I have a stomach of steel though, so I rather enjoyed it. Also, what is the conversion rate on EC$? Hey Katie, I wish I had a stomach of steel! haha. Ya, it’s always something I have to think about – no matter how rocky, or calm the boat ride is. I always take a motion sickness pill and sniff Tiger Balm! Ferry rides can be rough. I traveled around the Philippines for a couple months and took ferries everywhere. Some were smooth and some…not so much. One ride in particular turned out to be on a fairly small boat. The journey took nine hours! Thankfully it was a perfect day and not too bumpy. I cannot imagine what a disaster it would have been had the seas been rough! So sketchy!! 9 hours on a small boat?!!! Where were you going to/from? That’s a long time in a small ride. You’re right though, sometimes the seas are very calm and the ride is amazing and totally enjoyable. Other times…not so much! We are planning on doing a sailing course in the Caribbean, so good to know that the sea is usually calm in the summer. I have never been seasick, but my boyfriend gets easily seasick. That will be amazing! We’ve recently met two people from Canada doing their sailing course as well around Saint Vincent and the Grenadines and they loved it! Said it was a very cool experience 🙂 The seas are the calmest in the summer months. Carriacou and Curacao are not the same place guys. lol, didn’t notice the spelling error / country error on their part.